This strong 6 bottle wine 80GSM non-woven tote features dividers to protect the bottles from breakage and sturdy construction provides stability when transporting. Handles includes hook and loop fastener closure so that the bag is easier to carry when at maximum usage. 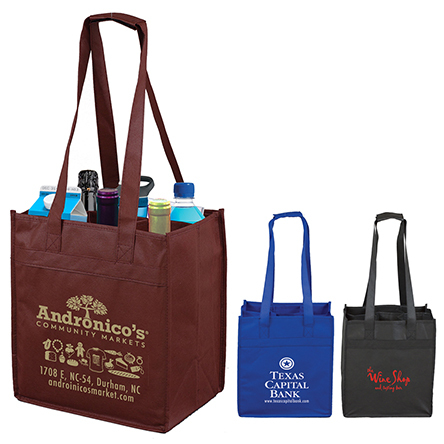 This durable wine tote is an excellent gift for anyone including for wineries, vineyards, bed and breakfasts, and corporate celebratory events. It also has 2 storage Pockets inside. Washable, Reusable and Recyclable. Spot Color Setup Charge: $﻿55.00 (G) per color, per location. PMS Color Match Charge: $40.00 (G) per color, not available for Photoimage ® Full Color﻿ imprint. ﻿ Click here for Standard PMS Color. Email Proof Charge: $﻿7.50 (G), add 2 days to production. Spot Color Price Includes: One color imprint, one location. Photoimage ® Full Color Imprint Price Includes: up to a Full Color Imprint. Exact color match cannot be achieved. Add 3 Days to Production. Pre Production Proof: Domestic Item: $45.00 (G). Production Time: 2-3 Days. Photoimage ® Full Color imprint Bags: $160.00 (G). Production Time: 5 Days. If revisions are made to any Pre Production proofs, a new pre production proof charge that includes any additional art, die or screen charges will apply. Speculative Sample: Spot Color - $45.00 (G), plus setup charges, cost of the item and cost of any additional color per unit running charges and freight charges. Photoimage ® Full Color﻿ Imprint Spec Samples- $160.00 (G), plus setup charges, cost of the item and cost of any additional color per unit running charges and freight charges. Production Time: 3-6 Days.